Alzheimer’s disease (AD) is the most common dementia and the number of patients is growing worldwide. Biomarkers to identify people at risk of AD before the onset of cognitive decline are urgently required, because disease-modifying drugs are likely to be effective only in the preclinical stage. Given that an early and invariable neuropathological feature of AD is the deposition of amyloid β-protein (Aβ) as fibrils (amyloid) in the brain, investigators are seeking biomarkers as surrogates of cerebral amyloid deposition. So far, two diagnostic procedures, i.e., cerebrospinal fluid examination and amyloid imaging by positron emission tomography (PET), have been developed for this purpose. However, the former is invasive and the latter is costly and not widely available. Thus, plasma Aβs have been extensively studied as potential alternatives. Unfortunately, the results so far have not been satisfactorily informative on the state of amyloid deposition in cross-sectional studies. As reported in this issue (pp. 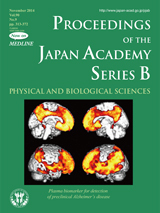 353-364), Dr. Kaneko et al. measured Aβs and Aβ-related peptides in plasma samples obtained from aged individuals who all underwent amyloid imaging by PET, employing highly sensitive immunoprecipitation-mass spectrometry. In this study, they successfully identified, for the first time, a plasma biomarker that serves as a precise surrogate of cerebral amyloid deposition. 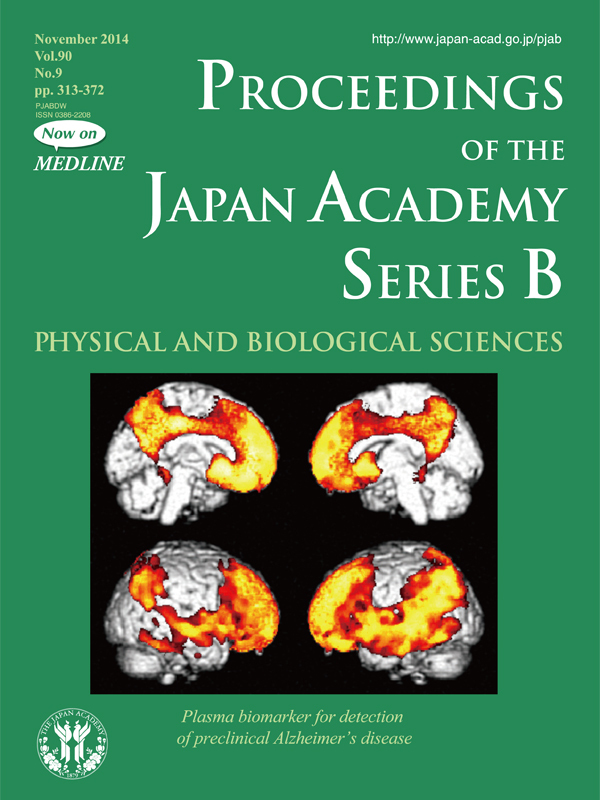 The cover picture shows the result of regression analysis between PiB-PET images and plasma APP669-711/Aβ1-42 levels in the subjects examined; brain areas that showed statistically significant correlations are visualized in yellow-red gradation on the 3D-rendered standard brain (viewing from the medial side (upper) and lateral side (lower) of both hemispheres). These images clearly demonstrate that plasma APP669-711/Aβ1-42 is an excellent surrogate of cerebral amyloid deposition. As the authors noted, their novel biomarker is expected to be a powerful community screening tool for detection of preclinical AD, and thus it should facilitate disease-modifying clinical trials.